The day we buried Bury! Crawley Town got their 2011/12 FA Cup campaign off to a flying start at Gigg Lane this weekend with a stunning performance against League 1 side Bury. After last season’s success it was clear that Steve Evans wants more of the same. 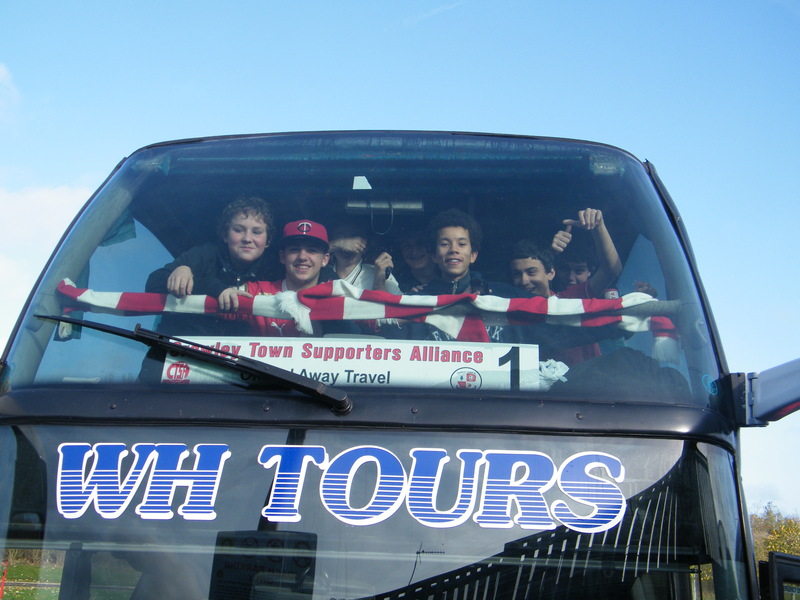 For most of the 198 away fans the day started very early; leaving the Broadfield at around 8am. The Alliance coach made great headway north arriving at 1.30pm. 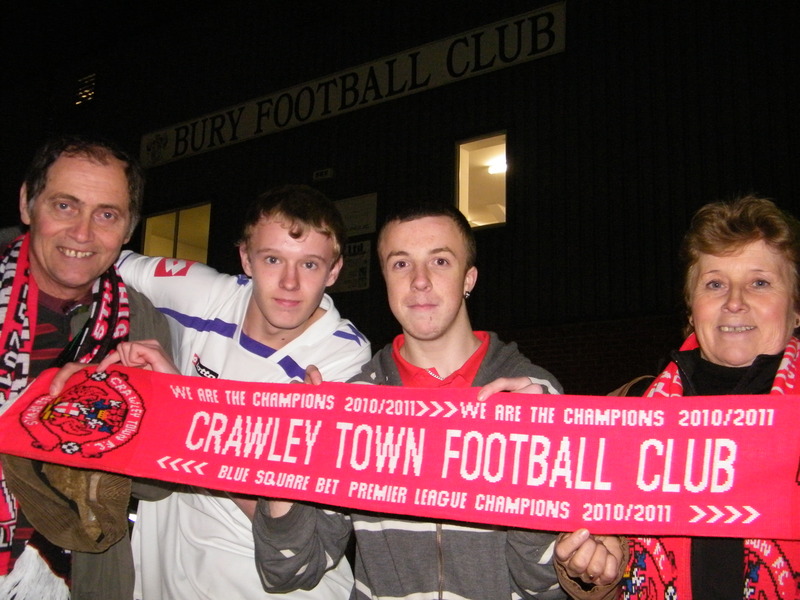 Courtesy of CTFC two complimentary match day tickets were up for grabs. The two lucky winning numbers as chosen by Sergio’s mum and dad belonged to Ollie Nottage and Paul “Marathon Man” Clarke . A New Kids on the Block tribute band! Mr and Mrs Torres, mum and dad of fan’s favourite Sergio, were on board for the journey to Bury to watch Sergio and the team secure their 2-0 victory.Travel Ken ensured that the couple sat next to Nikki who speaks fluent Spanish and who acted as interpreter throughout. The couple are on a month long vacation to the UK and will be flying back to Argentina on 7th December. They both appeared to enjoy their match day experience, even sharing Sergio’s sweets with those on the coach (there were none left for Sergio, but he’s a professional footballer and shouldn’t be eating such things anyway, so we did him a favour)! 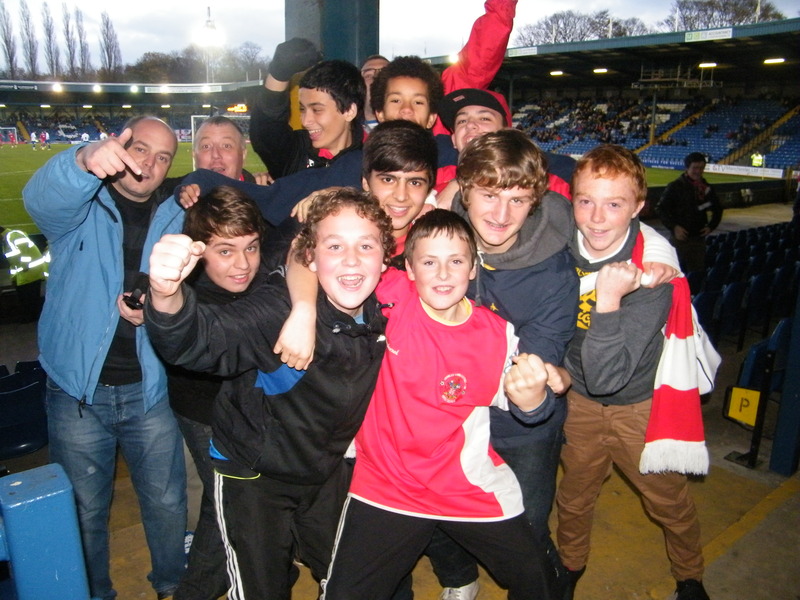 They were kept entertained along with the other Crawley fans by a video re-run of our Derby County match last year. Their enjoyment was evident- and emotional-and proved that football is an international language. Gigg Lane is a tidy all seater ground with an 11,000 capacity. Situated in the heart of a traditional residential area there is a true community spirit about the place. Away supporters are openly welcomed into the social club and are spoiled to a brilliant view of the action from the covered ‘Cemetery End’. Seats were hardly used as Town fans were on their feet for most of the match. Prior to Kick Off there was a moving ‘Last Post’ fanfare and silence for fallen soldiers. The event was impeccable respected by both sets of fans. Who's that strange bloke pointing a camera? Just smile, he'll go away! 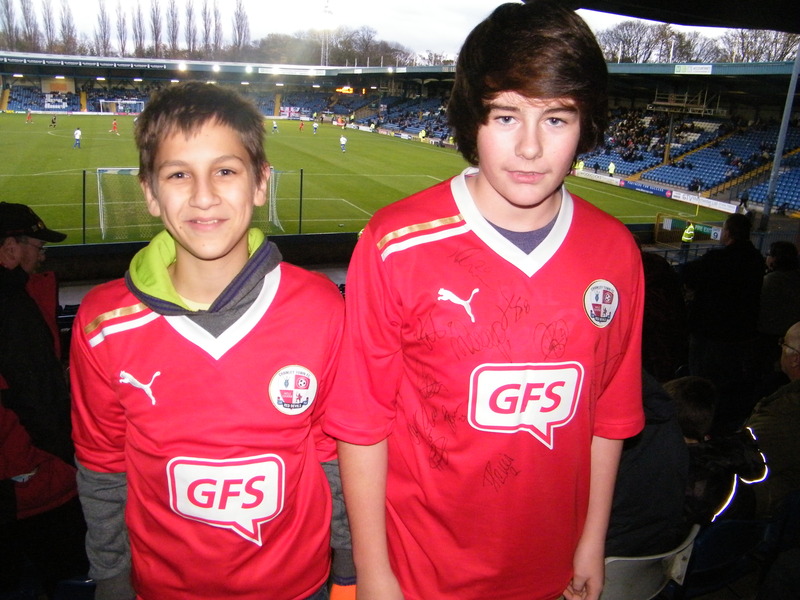 Adam Stanford from Maidenbower and David O’Doherty of West Green were enjoying the game. 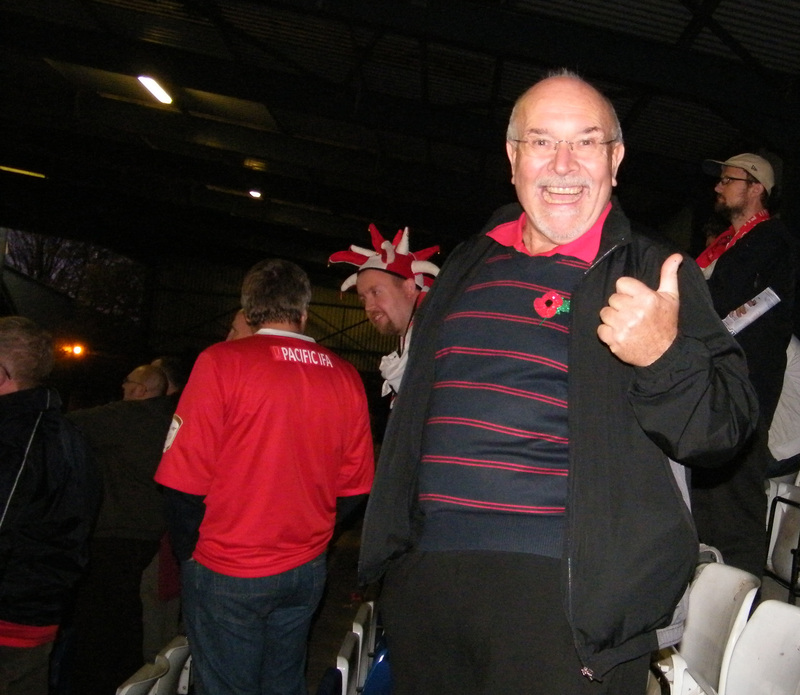 During half time Adam said ‘ we have been brilliant in that first half and are very unlucky not to have taken the lead !’ David suggested ‘ if we keep playing like that then I am sure we will go on to win !’ Crawley Town stalwart Ian Hands quipped ‘ it is a travesty that we haven’t scored!’ Travel Ken was busy predicting a nil-nil draw and asking about replay dates. He was alone in expecting no goals! The deserved breakthrough came at 50 mins when Tyrone got his head to a Drury corner. It sparked wild celebration in the away end and much subsequent chanting and singing. Bury did stage a short revival and were very unlucky with a mad goal mouth scramble but recovery was short lived. Either we've just scored or that burger had far too many additives......! Substitute Michael Doughty finished off a great move on 80 mins sending the Reds into the next round, and shortly afterwards home favourite Mark Hughes was sent off. By this time noise in the away stand had reached fever pitch and as home fans drifted away a chorus of new favourite ‘ Is there a fire drill?’ echoed around the ground. At the final whistle there was a wonderful feeling of togetherness and team spirit as fans and players celebrated a magical moment and Sergio celebrated with his parents. 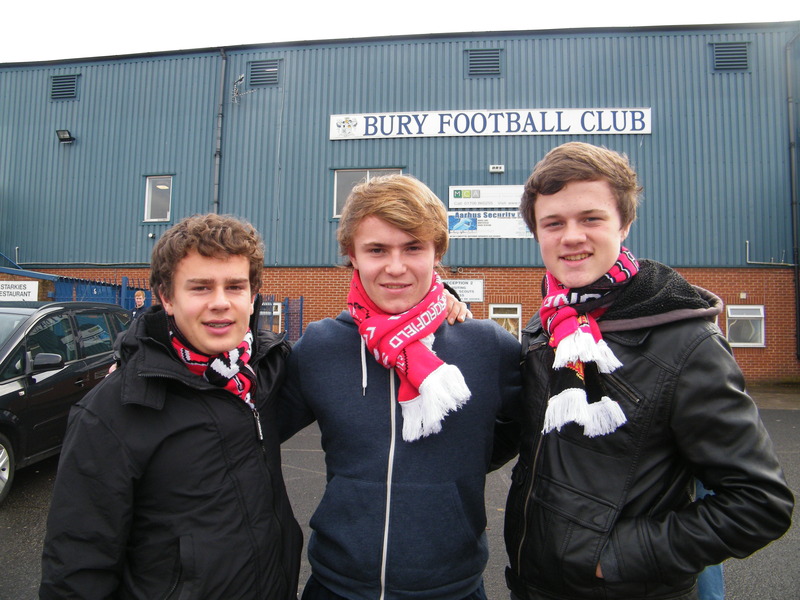 Alliance members Shaun Smith from Southgate and Michael Geal from Bewbush certainly enjoyed the game. Shaun said ‘ we dominated that match for long periods and except for a couple of dodgy moments were worthy winners! He added ‘ Andy Drury was my man of the match, he was top quality throughout and delivered a perfect corner for the opening goal’ Michael said ‘ it has been a great day out and well worth the money spent. We will definitely be following the team in the next round’. Travel Ken predicting a no score draw-just before Tyrone scores! The day reflects another solid performance by the Alliance’s ‘Travel Ken’ and ‘Travel James’. The long transfer up and back passed without major incident and was comfortable throughout. Thanks to WH Tours drivers Casey and Phil for their efforts on the day. Now, bring on Oxford City or Redbridge, and onwards to the third round. Look out Manchester United, we’re coming to get you!